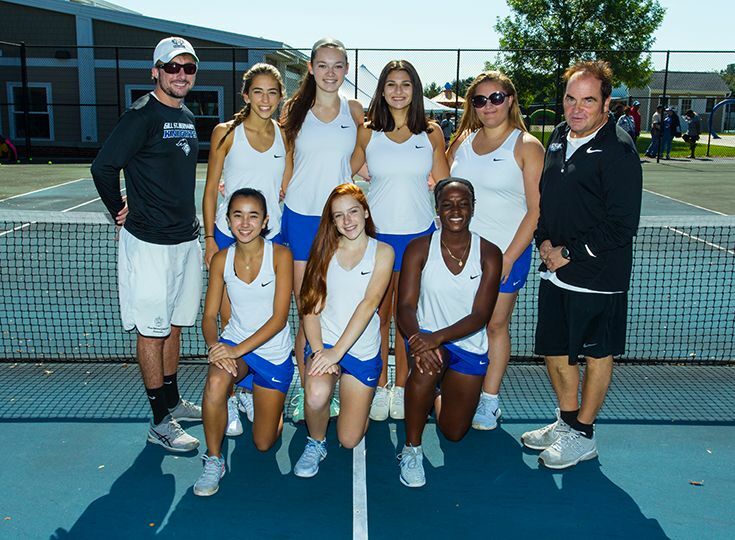 The girls’ tennis team enjoyed one if its best seasons in program history as the Knights won their first Prep B championship in eight years and finished the season ranked 12th in the state. Gill began the season in impressive fashion, winning the first four matches, including victories against Top-20 opponents such as Pingry and Ridge. The Knights continued that success throughout the season and easily advanced to the Non-Public B sectional final before falling to highly ranked Newark Academy in an extremely close 3-2 match. The Knights were able to rebound quickly, however, as they claimed their first Prep B championship since 2010. Mayjah Jean-Pierre '21 and Ella Baker '21 took home gold in first and second singles respectively while Michaela Kroon '22 won third singles. Also having an impressive showing was the reigning Somerset County champion duo of Andree Aloise '19 and Tori Goldin '20 as they advanced to the championship final in first doubles. Overall, the Knights finished a record of 11-4. With a wealth of young talent returning to the court, Gill should look forward to another successful season next fall.